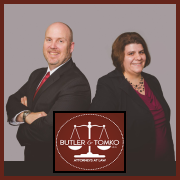 Butler & Tomko’s approach to the practice of law is to be accessible to clients when they need it most. The office consists of two partner-level attorneys and one assistant. Our streamlined approach means that when you call, email or message us through our client portal, you are connected with someone that you know and someone that knows your case. This approach eliminates the use of inexperienced attorneys as well as receptionists and other staff that do not know who you are. The result is reaching someone that can help you with your problem more efficiently. ​Contact us today to find out how our business model can help you navigate the legal issue facing you.